Two-time champion Maria Sharapova has not been given a wild-card entry for the French Open. Announcing the decision on a live Facebook broadcast on Tuesday, French Tennis Federation president Bernard Giudicelli said he informed Sharapova of the decision in person that it was not possible. For Bernard Giudicelli, the fight against doping was more important than Maria Sharapova's popularity. So he decided not to award her a wild card for the French Open. Giudicelli, the president of the French Tennis Federation, phoned two-time champion Sharapova on Tuesday to tell her she would not get an invite to play because of her past doping ban. The same day, Sharapova retired from her Italian Open match against Marjana Lucic-Baroni while leading 4-6, 6-3, 2-1. She had left the court for an injury timeout earlier in the match, and came back with her left thigh taped. Besides the French Open, three other tournaments, including the Italian Open this week, have given her wild cards since her return from a 15-month ban last month, but Giudicelli wasn't swayed. "While there can be a wild card for return from injury, there can't be a wild card for return from doping," Giudicelli said while announcing his decision on a live Facebook broadcast. He accepted a lot of fans wanted to see her play, but he would not grant special favors. "I read the results of several polls and I could see that about two-thirds were in favor of Maria being granted a wild card. Of course I felt some pressure," he said. "We did not want to treat Maria Sharapova differently ... Maria won twice here, but we have a huge responsibility." He felt that offering Sharapova a short cut into the main draw was to send the wrong message in the fight against doping in sports. "She might be very disappointed, but it's my responsibility, it's my mission to protect the game and protect the high standards of the game," he said. "I know that a lot of people might be disappointed by this decision. But nevertheless Roland Garros invests a lot — along with the other Grand Slams, the ATP, and the WTA — into the fight against doping. It was inconceivable to take a decision that would have been the opposite of this. "I know the media dimension Maria has. I know the expectation fans and broadcasters have. But it didn't seem possible for me to go above the strong commitment and the respect for the anti-doping code." Thanks to wild cards at her first two tournaments, she lifted her world ranking to outside the top 200 this week. But that wasn't good enough to make the cut even for the qualifying field at Roland Garros, so she will miss the tournament for a second straight year. The French Open begins on May 28. Sharapova initially was given a two-year suspension after testing positive for the banned heart drug meldonium at last year's Australian Open. The Court of Arbitration for Sport reduced the ban on appeal, ruling she bore "less than significant fault" in the case and she could not "be considered to be an intentional doper." Sharapova had been taking meldonium for many years, but overlooked announcements by WADA that it added the drug to its banned list on Jan. 1, 2016. "The Court of Arbitration reduced her suspension but also recognized that Maria was the sole person responsible for her misfortune," Giudicelli said. "It's not down to me to question that decision and, I repeat, we must respect decisions that were taken." Top-ranked players Angelique Kerber and Andy Murray spoke out against Sharapova receiving wild cards, while Eugenie Bouchard openly called her a "cheater" who should be banned for life. Many players believed Sharapova should have had to start in bottom-rung tournaments to improve her ranking, rather than receive free passes into events on the main tour. 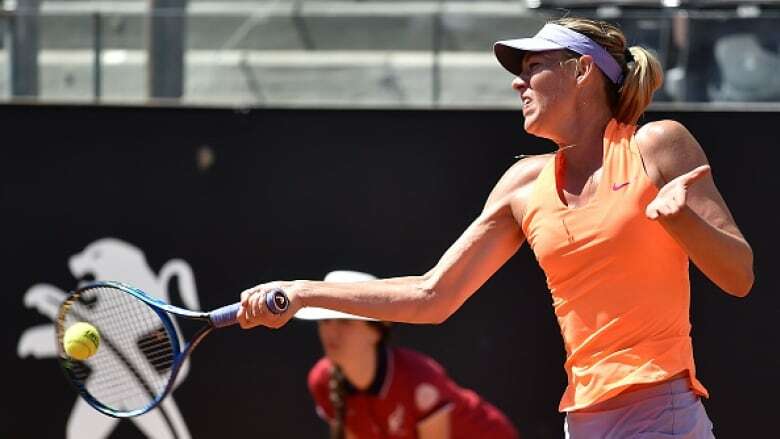 She was given wild cards at Stuttgart and Madrid before the Italian Open this week. She was a past champion at all three. In Stuttgart, WTA CEO Steve Simon told German broadcaster ZDF she had paid the price. "I don't think a suspension should wipe out the career's worth of work," Simon said.